Cafe Express is a American, Cafe, and Burgers restaurant where most Menuism users came for a meal on the go and paid less than $10. A diner from US tried it. 1 review of Cafe Express, first by Rbeaty. I have eaten here for years and lately have been getting food mostly to go. One of the dishes I get on a regular basis is the club sandwich. I have noticed the last couple of times that they put hardly any fries in the order. Yesterday I got a club sandwich and saw that there was a ridiculously small amount of fries. 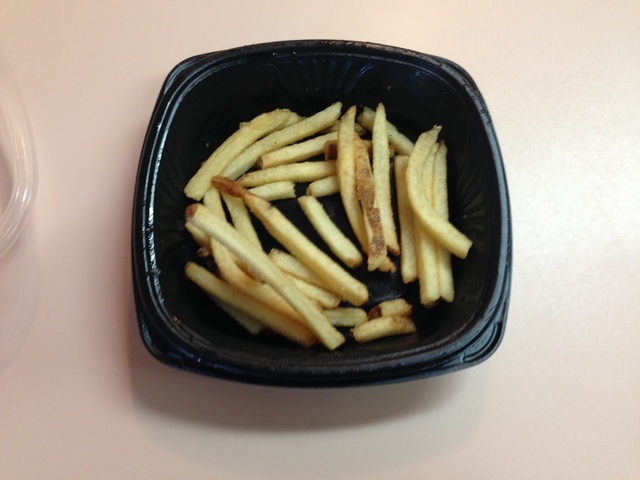 I brought this to the attention of the counter person, and was told that Café Express is now portioning out their fries. I left and called a manager, and was told that they had been giving out so many fries that it was effecting their bottom line. She said that they now gave 5 oz of fries with their orders. 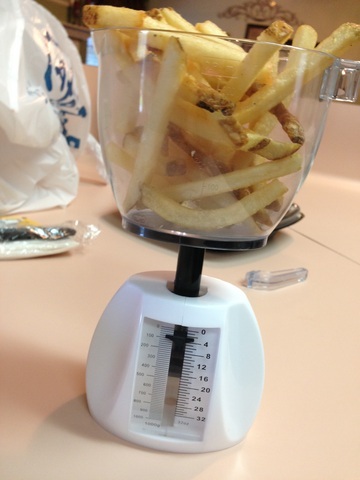 When I got home I actually weighed the order of fries, and found I had been given 3 oz of fries. My order was almost $10 for the sandwich and fries, and this the amount of fries that they include. It is unbelievable that their management feels that the few cents they saved in cheating me is worth the bad will a customer feels by walking away feeling cheated. They are now including an absurdly small amount of fries with this sandwich. It used to be a good deal, but yesterday I got 3 oz of fries with my sandwich. After pointing out what a small amount of fries I was given, the clerk said that they are portioning out their fries now and that is the amount they give out. I hope they enjoy the money they made off of me, because that is the last they will get of my money. These dishes from the Cafe Express menu are contributed by Menuism users directly, as part of a restaurant review, or as part of a photo upload. Do you own Cafe Express? Contact us to connect with your diners. Cafe Express is located near the cities of Clear Lake City, Nassau Bay, and League City. People found this by searching for: Cafe Express, Clear Lake, Cafe Express Clear Lake, Cafe Express Menu Clear Lake, Breakfasy Menus, Cafe Express Clear Lake Texas, Cafe Express Gluten Free Menu, and Cafe Express 77598.